Does your non profit organisation have a solid process in place to encourage supporters to update their contact details? Is the process multi-channel? 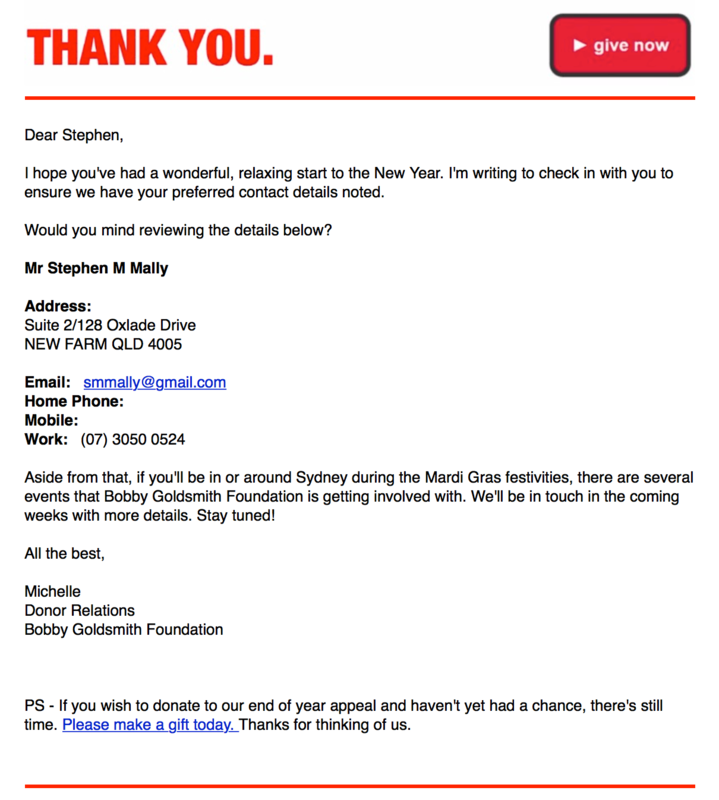 I received an email from Bobby Goldsmith Foundation on Friday and I was pleased to have the opportunity to update my details. The piece is best practice and I want to share it with you. 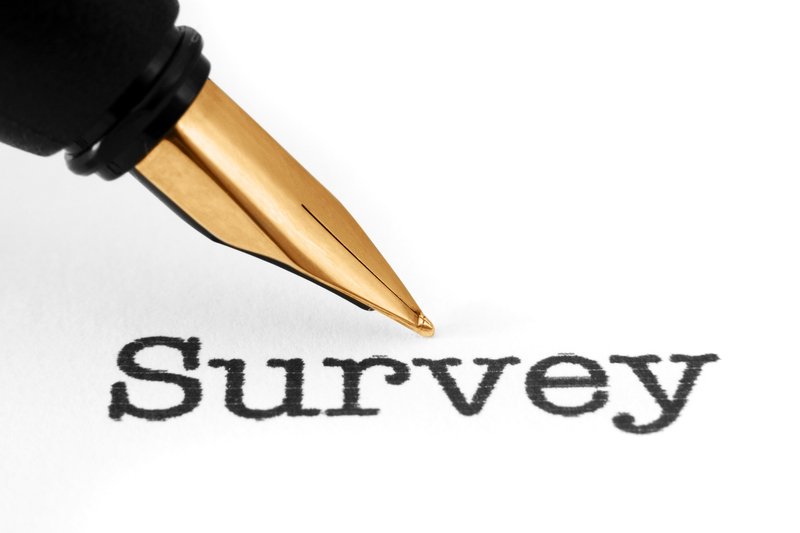 Create a process to allow for online/Email, phone, and post responses. Ensure online responses land in your constituent relationship management (CRM) system to eliminate the need for rekeying of information. Always allow for the donor to give an additional donation. If you do not, you’ve missed an opportunity. Donors often times will realise they failed to keep you posted of their movements and realise they are not current in their support of your organisation. Ask for more information than you currently hold on the supporter. Lack a person’s mobile or home numbers? Lack their email address? Remember, this is about enhancing their contact record as much as it is editing their record. Show the lack of information on their form. It’s the time of the year when all charities should be reviewing, strengthening, and, in some cases, developing internal processes. Take a moment and look at your contact details update process. Is your nonprofit organisation sending supporter or membership cards to donors? Are the cards simple card stock or are they embossed on plastic to simulate a credit card or true membership card? I recently received two examples, and my Aunt received one, which stood out to me. One appears as authentic as my American Express or VISA cards. The cards feature the supporter name, supporter number, and date in which support of the organisation commenced. One of the “member” cards I received was actually in an acquisition direct mail pack for the Wounded Warrior Project – an organisation I have never supported. 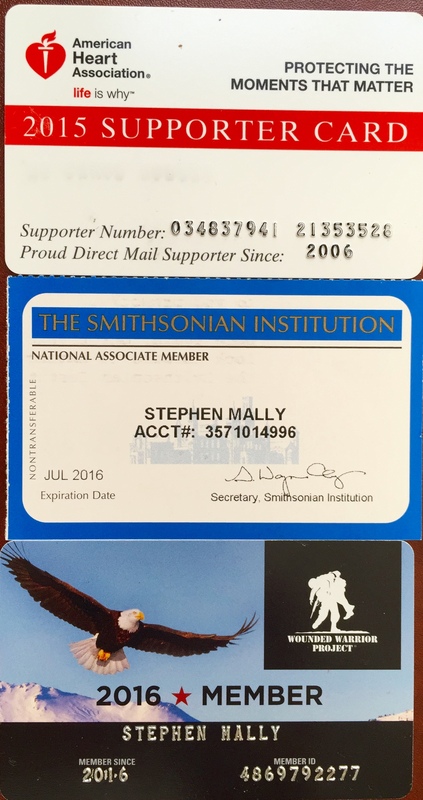 One was a true membership I hold – for the Smithsonian Institution, which I joined last May while in DC. My Aunt’s, from the American Heart Association, is made of similar plastic material/weight used for credit cards. The card reminds me of my old AAA road service card from the US. The American Heart Association card appears to be part of an annual program noting the current year, but also noting her support since 2006. I am guessing these types of cards appeal to the typical nonprofit direct marketing audience – female, over the age of 70, and to people who want to feel like they “belong” and “matter” to an organisation. The American Heart Association card obviously meant something to my Aunt because she saved it in a drawer. I am guessing she kept it and it meant more to her because it looked so similar to a credit card. It struck me that I do not recall seeing these types of cards used often in Australian charitable organisations. Am I wrong? Is your organisation using these types of cards as part of your strategy?